The final performance at the Sakewewak Storytellers festival was cellist Cris Derksen's Ochestral Powwow performed by the RSO with Indigenous dancers. The 16th annual Sakewewak Storytellers Festival held its final performance Saturday evening at the First Nations University of Canada, featuring Indigenous powwow dancers and an orchestra ensemble surrounding a powwow drum group. The performance, a first of its kind for the festival, was a result of the Sakewewak Artists' Collective artist residency program that pairs emerging artists with established artists. "They were challenged with developing their own interpretation of one or more of these songs by Cris Derksen," said Sakewewak director, Adam Martin. The songs made by Derksen are from her Juno-nominated album, Orchestral Powwow, released in 2016 — an album that blends Indigenous pow wow songs with classical symphony sounds. 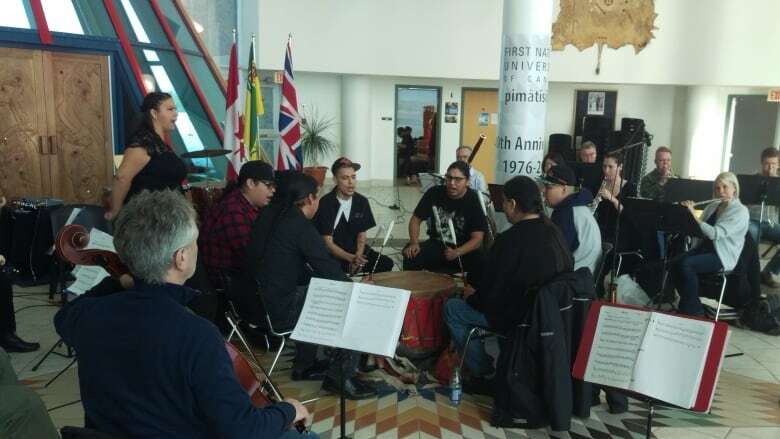 The performance featured members of the Regina Symphony Orchestra playing bass, cello, trombone, clarinet and flute alongside powwow drum group, the Chippewa Travellers. Derkson, who is a classically-trained cellist, was a featured artist at Sakewewak's 2013 storytellers festival said the music is a culmination of her Indigenous roots uniting with her European roots. "It was a way for me to reconcile who I am as a classically-trained colonial Indigenous human," said Derksen. "It's something you've never heard before. We take that white man conductor telling you what to do completely out of the scenario and instead of having a conductor, we follow the heartbeat of the Indigenous drum." Teddy Bison, one of the artists selected to create a dance performance to Derksen's music, said the task has been something he always wanted to do as a child. "Now that we are making it a reality, it's exciting," said Bison, who is a men's fancy dancer from Ocean Man First Nation. "It's different because the timing's different … men's fancy dance is a very aggressive dance and a lot of the music that we have been practicing to gives a softer feeling. That was my biggest challenge, to soften things up." Bison said he looks at the opportunity as a chance to reflect on his more than two decades of dancing; it was a good way to challenge himself. Derksen, who has taken the show on the road on three other occasions, said her next Ochestral Powwow performance will be in Yellowknife, NWT next week.